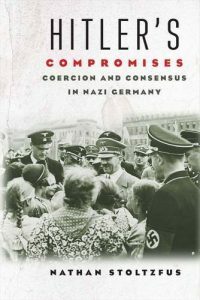 Hitler’s Compromises Coercion and Consensus in Nazi Germany (Yale University Press, 2016) is a comprehensive and eye-opening examination of Hitler’s regime, revealing the numerous strategic compromises he made in order to manage dissent. Jacob Heilbrunn, editor of The National Interest, wrote of Hitler’s Compromises that “Stoltzfus’s ambitious study seeks to correct the perception of the Nazi state as a seamless totalitarian organization that easily cowed Germans into unthinking obedience. The author suggests there was more to it than that: rather than seek to rely automatically on outright terror, Hitler was surprisingly prepared to compromise politically in order to avoid jeopardizing his popularity with the German people. .. . Hitler regularly restrained his subordinates from escalating their persecution of the churches during wartime.” By 1943 propaganda minister Joseph Goebbels complained, “The people know exactly where to find the leadership’s soft spot and will always exploit it.” Stoltzfus demonstrates that by pretending to be moderate at key points, Hitler worked to enlist Germans to fulfill his mission of building a New Order, a sobering reminder about the threat posed to any democratic society by a crafty demagogue. During the run up to the 2016 election, in light of Hitler’s Compromises: Coercion and Consent in Nazi Germany, Stoltzfus was asked to comment in the media on the frequent comparisons of Hitler and Donald Trump. www.thedailybeast.com/contributors/nathan-stoltzfus.html. This seminal work has spawned a considerable debate among academics, leading to what Die Zeit called a “historian’s controversy” (kleine Historikerstreit). His interviews have brought to publication the voices of Germans who were otherwise never interviewed about their wartime experiences, not only of Nazi victims but also its perpetrators including Leopold Gutterer, Joseph Goebbels’ Under Secretary of Propaganda. His work has been published in seven languages. Social Outsiders in Nazi Germany (Princeton University Press, 2001), co-edited with Robert Gellately, reveals the range of groups persecuted under the Nazis and the role of society in their victimization. When Hitler assumed power in 1933, he and other Nazis had firm ideas on what they called a racially pure “community of the people.” They quickly took steps against those whom they wanted to isolate, deport, or destroy. In these essays informed by the latest research, leading scholars offer rich histories of the people branded as “social outsiders” in Nazi Germany: Communists, Jews, “Gypsies,” foreign workers, prostitutes, criminals, homosexuals, and the homeless, unemployed, and chronically ill. 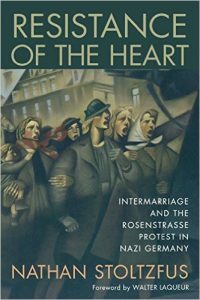 Although many works have concentrated exclusively on the relationship between Jews and the Third Reich, this collection also includes often-overlooked victims of Nazism while reintegrating the Holocaust into its wider social context. The Nazis knew what attitudes and values they shared with many other Germans, and most of their targets were individuals and groups long regarded as outsiders, nuisances, or “problem cases.” The identification, the treatment, and even the pace of their persecution of political opponents and social outsiders illustrated that the Nazis attuned their law-and-order policies to German society, history, and traditions. Hitler’s personal convictions, Nazi ideology, and what he deemed to be the wishes and hopes of many people, came together in deciding where it would be politically most advantageous to begin. The first essay explores the political strategies used by the Third Reich to gain support for its ideologies and programs, and each following essay concentrates on one group of outsiders. Together the contributions debate the motivations behind the purges. For example, was the persecution of Jews the direct result of intense, widespread anti-Semitism, or was it part of a more encompassing and arbitrary persecution of “unwanted populations” that intensified with the war? The collection overall offers a nuanced portrayal of German citizens, showing that many supported the Third Reich while some tried to resist, and that the war radicalized social thinking on nearly everyone’s part.In addition to the editors, the contributors are Frank Bajohr, Omer Bartov, Doris L. Bergen, Richard J. Evans, Henry Friedlander, Geoffrey J. Giles, Marion A. Kaplan, Sybil H. Milton, Alan E. Steinweis, Annette F. Timm, and Nikolaus Wachsmann. Shades of Green: Environmental Activism around the Globe (Rowman & Littlefield, 2006), co-edited with with Doug Weiner and Christoph Mauch, examines the impact of political, economic, religious, and scientific institutions on environmental activism around the world. The book highlights the diversity of national, regional and international environmental activism, showing that the term ‘environmentalism’ covers an entire range of perceptions, values and interests. It demonstrates that each instance of environmental activism is shaped by historically unique circumstances, highlighting within each chapter the ideological, social, and political origins of efforts to protect the environment. 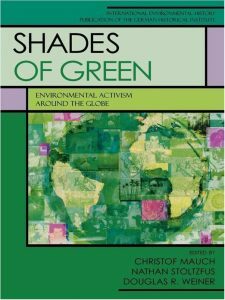 Discussing issues unique to different parts of the world, Shades of Green shows that environmentalism around the globe has been strengthened, weakened, or suppressed by a variety of local, national, and international concerns, politics, and social realities. 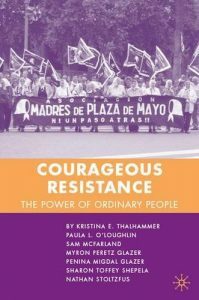 Courageous Resistance: The Power of Ordinary People (Palgrave MacMillan, 2007), co-authored by professors of history, political science, and sociology, introduces readers to a spectrum of types of resistance to tyranny and investigates the factors that motivate and sustain opposition to human rights violations. 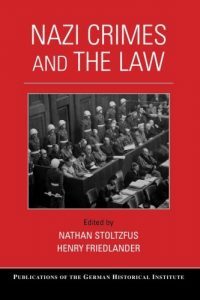 Nazi Crimes and the Law (Cambridge University Press, 2008), co-edited with Henry Friedlander, examines the efficacy of national and international law to prosecute perpetrators of Nazi crimes, the centerpiece of twentieth-century state sponsored genocide and mass murder. 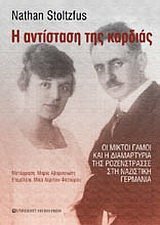 In its various essays, the contributors reconstruct the historical historical setting of the crimes committed under the aegis of the Nazi regime and examine why postwar adjudication took place only within limits, within the national and international judicial forums responsible for prosecuting perpetrators. The topics discussed include the impact of the Nazi justice system on postwar justice, postwar legal proceedings against those who committed war crimes and genocide, the work of the Nuremberg tribunal and Allied trials, and judicial investigations and prosecutions in East Germany, West Germany, and Austria. 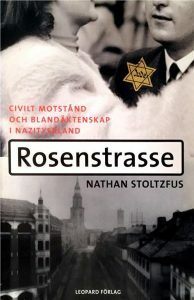 They span the postwar period up to contemporary U.S. legal efforts to deport Nazi criminals within its borders and libel trials against Holocaust denials in London and Canadian courts and libel suits brought by Holocaust deniers in British and Canadian courts, and they reveal new perspectives on the present and future implications of these trials. Stoltzfus’ article for this collection as well as for The Oxford Handbook of Fascism, R.J.B. Bosworth, editor (Oxford University Press, 2009) considers the memory and representations of fascism since WW II in Italy and Germany. 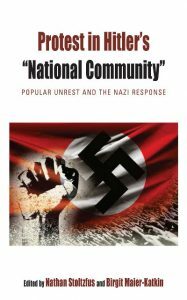 Protest in Hitler’s “National Community” Popular Unrest and the Nazi Response (Berghahn Books), co-edited with Birgit Maier-Katkin, Afterword by David Clay Large. In common perceptions, Hitler’s Gestapo slapped down every sign of opposition. This study of public, collected displays of dissent by “racial” Germans within the Reich examines cases of public, social dissent both before and during the war that were serious enough to command a response from the regime. Not only workers, but also women protecting their families as well as Protestants and Catholics determined to continue their church traditions, convinced the regime to appease rather than repress expressions of disagreement by “racial” Germans. 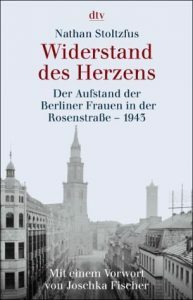 Anfang März 1943 wurden in Berlin die noch in der Stadt verbliebenen Juden, vor allem aus sogenannten Mischehen, von der Gestapo verhaftet und in ein Sammellager in der Rosenstraße gebracht, um deportiert zu werden. Doch Familienangehörige und Freunde versammelten sich protestierend tagelang immer wieder vor dem Gebäude, ließen sich von Erpressungsversuchen und Gewaltandrohungen nicht einschüchtern und erreichten schließlich das kaum Glaubliche: Ihre Angehörigen wurden freigelassen. Nathan Stoltzfus beleuchtet das bisher wenig erforschte Schicksal der »Mischehen« und »Mischlinge« und erzählt auf der Grundlage zahlreicher Interviews mit Zeitzeugen die dramatische Geschichte der Protestaktion. Nathan Stoltzfus, geboren 1954, studierte Geschichte an der Harvard University und an der Freien Universität Berlin. Er lehrt Moderne Europäische Geschichte an der Florida State University. Hiver 1943. – Goebbels, malgré les engagements précédents du Reich, décide d’envoyer à la mort quelque 2 000 Juifs berlinois mariés à de bonnes Allemandes, aussi aryennes qu’il se peut. Mais contre toute attente, les femmes en question se rebellent, et la rue les soutient ! 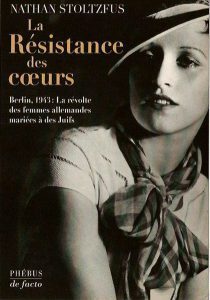 On envoie contre elles des Ss armés, tandis qu’elles hurlent ” Rendez-nous nos maris ! ” Quand les forces de l’ordre nazi menacent de tirer, elles font savoir qu’elle n’ont pas peur des balles. Elles tiendront ainsi une dizaine de jours sans que le pouvoir – craignant les réactions de la ville en émoi – ose employer contre elles ses moyens habituels. Et leurs maris, sur ordre de Hitler en personne, leur seront rendus : tous survivront à la guerre. A travers le destin – le ” roman vrai ” – de plusieurs de ces femmes, interviewées longtemps après les événements, l’historien américain Nathan Stoltzfus nous fait revivre au jour le jour la révolte de ces irréductibles qui osèrent affronter Hitler en Allemagne même… et qui nous démontrent que même dans les conditions les plus défavorables, la résistance au pire était non seulement possible mais payante. L’ouvrage, couronné ” livre de l’année ” aux Etats-Unis en 1996, repris en Allemagne avec un beau succès, est publié ici avec une préface de Joschka Fischer – aujourd’hui ministre des Affaires étrangères d’Allemagne. De icke-judiska kvinnornas kamp gav resultat. Goebbels frigav de judiska männen. Men varför gav han efter? Professorn Nathatn Stoltzfus har intervjuat de överlevande från Rosenstrasse och studerat den nazistiska politiken mot dem som levde i blandäktenskap. Han menar att de nazistiska ledarna visste hur lätt missnöje kunde spridas och växa och var därför rädda för social protester. När ett antal modiga kvinnor lät sig styras av hjärtats röst och trädde fram öppet blev de framgångsrika. Om fler människor vågat protestera kunde kanske den nazistiska utrotningspolitiken ha stoppats eller försvagats. Hitler 1993’te iktidara gelince, onun ve diğer Nazilerin kafalarında tamamen saf bir ırktan müteşekkil bir topluma dair gayet belirgin fikirler vardı. Hızla, toplumdan dışlamak, uzaklaştırmak ve yok etmek istedikleri kesimlere karşı harekete geçtiler. 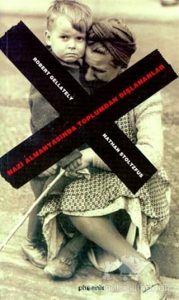 En son araştırmacılar, Nazi Almanyasında “toplum dışı“ olarak yaftalanan insanlara dair zengin bilgiler sunmaktadır. Komünistler, Yahudiler, “Çingeneler,“ yabancı işçiler, fahişeler, eşcinseller, evsizler, işsizler ve kronik hastalar. Bugüne dek birçok çalışma özellikler Yahudiler ve Üçüncü Reich arasındaki ilişkilere eğilmiş olmasına rağmen, bu derleme hemen Soykırımı daha geniş bir toplumsal bağlama oturtuyor hem de Nazizmin çoğunlukla göz ardı edilen kurbanlarını inceliyor.